Christmas is all around us! And one of DHTMLX users, Monty Scroggins, developed a very useful application for tracking Christmas gifts. Read the full article to get learn more about it! 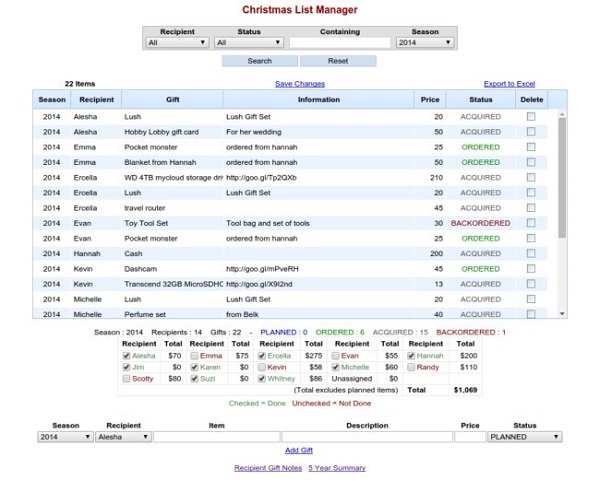 Christmas List Manager is a full featured web application that can be used to track and manage gifting year after year. It is quick, simple and effective at reducing the difficulty of tracking what gifts were bought when and for whom. It also to gives plain insight into the disbursement for the different gift recipients. Have you ever stumbled across an item and thought “I will have to remember that item at Christmas time” only to have totally forgotten about it when December rolls around? Christmas List Manager can help with all of this. See spending totals per person on the gift list and a grand total for everyone on the gift list. View a 5 year trending summary for everyone on the gift list. Gift recipients are marked as ‘done’ on the user checklist as the gifting for the recipient is completed. Gifts can be added as ‘Unassigned’ so that they can be recorded in the system without being assigned to a recipient until later. All items for a particular gift are easily updated with the edit-in-place capabilities of dhtmlxGrid. Notes can be recorded to track the ‘likes’, ‘dislikes’, ‘needs’, and ‘doesn’t need’ items for each gift recipient. Search across the gift database by any of the gift elements (season, recipient etc) . Included is a ‘contains’ text keyword search. Data is exported to a spreadsheet. A simple scripted design with very few backend requirements. The Christmas List Manager was developed with simple Perl web CGI scripting, and utilizes the dhtmlxGrid to do ‘the heavy lifting’ for manipulating the data elements. The dhtmlxGrid object reduced the difficulty in building the application to a minimal effort. And it creates a beautiful display as a bonus even with the default display theme. Managing the different elements in the grid is very fast and intuitive. The grid object is priceless. Installation is simple for anyone familiar with a simple web server and mysql style database backend. Start using it now! You can download Christmas List Manager here.